This carrot salad recipe is one you are likely to make over and over again. It is so popular in France that you can almost always find it in the deli case of the grocery store. 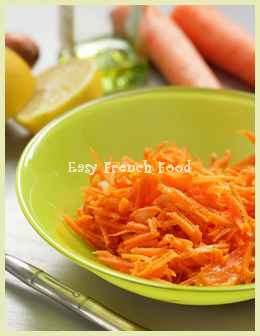 However, it is much tastier when you shred and dress the carrots yourself, and for the small amount of work involved, I really can't imagine why anyone buys this French salad already made. With Grilled Foods: You might like to serve this carrot salad recipe at your next barbecue. The crunchy, tangy yet sweet carrots go perfectly with grilled meats. In Sandwiches: You can also use this carrot salad recipe as a sandwich ingredient - try it with humus for a great tasting vegetarian lunch. Some people love grated carrots with peanut butter as well. French Food: The French like to serve this salad with many things, including savory crepes, omelets, quiches and tarts. Look for medium sized, smooth skinned, and vibrantly colored carrots. It's good if they still have their green tops on. Larger, thicker carrots tend to have less flavor and be tougher. Remove the green tops before refrigerating your carrots. The greens can actually dehydrate the rest of the carrot in your refrigerator. Peel the carrots and use a food processor to shred them. In a medium sized bowl, whisk together the olive oil, lemon juice, salt and pepper. Stir in the shallots and then add the carrots. Mix until the carrots are completely dressed. Cover and let this salad sit for an hour in the refrigerator to allow the flavors to blend. A l'orange: Add two oranges, cut in small pieces for a vitamin rich, super salad. Au thon: Add a can of drained, flaked tuna and a couple of chopped hard boiled eggs. Serve with French bread for a complete meal. Au persil: For color contrast, add several tablespoons of chopped, fresh, flat leaved parsley, mint, or coriander. Au miel: Add two tablespoons of honey and a handful of toasted almond slivers for a sweeter salad.